Here I am with more lunch box ideas and more pointers towards how to pack balanced meals in lunch boxes. 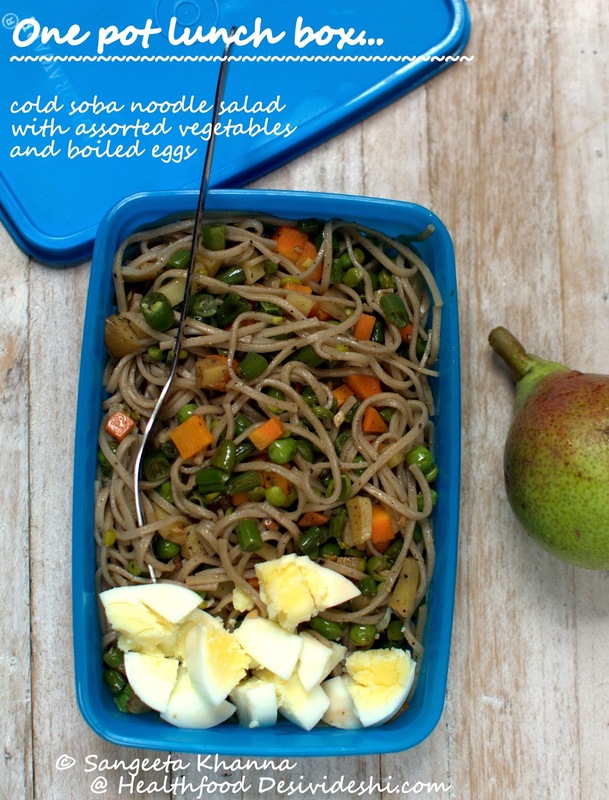 The ongoing lunch box series has been immensely satisfying and fun, I kept getting messages, mails and comments on the blog saying how useful you all are finding it. 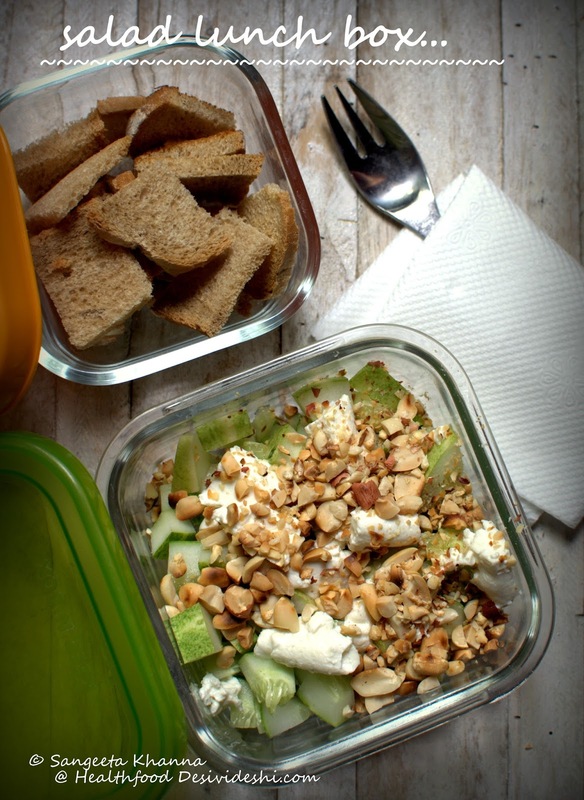 Many of you shared your ideas of lunch boxes too, thank you for that as it helps other readers too who struggle with preparing lunch boxes healthier. Salad meals in a lunch box work wonderfully if you include your favourite ingredients and take care of the textures too. Fruits, leafy greens and steamed vegetables make great salads but when making it a meal one needs to take care of a few things to make it a balanced meal. Include seasonal fruits or vegetables to make these salads. out of season is not worth. If using raw leafy greens in the salad make sure they are organically grown or home grown. 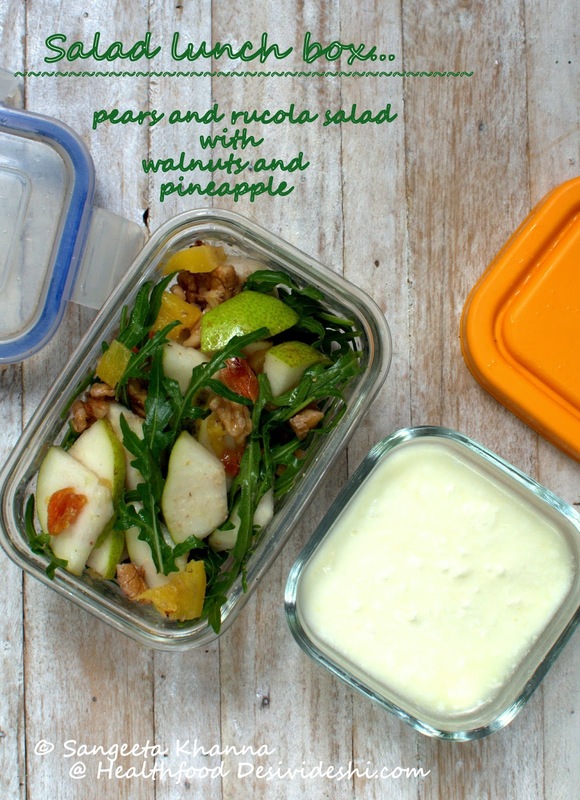 Use a vinaigrette dressing or a yogurt based dressing if the salads is being packed in a lunch box for 3-4 hours to stay. If packing cucumber batons or carrots etc on the side you can drizzle some vinegar to keep them from fermenting in summer months. Add pickled salads to fresh ingredients to toss new salads everyday. This way the salad keeps well for a few hours as pickled salads have some residual vinegar in it. Apart from the fruits and vegetables, it is good to add some source of protein in your salad. Lentils, beans, nuts, seeds or paneer cubes work really well to supplement a salad with protein. If you eat nonveg you can add boiled eggs, tuna flakes or poached chicken etc to make a filling balanced salad. Quit industrially produced sausages, home made sausages, prosciutto and bacon, ham etc are great. Hung yogurt or fresh cheeses also make the salads balanced and tasty. But you can use any good quality cheese you have access to. Make stir fry salads with the vegetables that can't be eaten raw. It helps to eat more salads that way. Pumpkin salads are my favourite. Chickpea salads are the most versatile. Just keep some boiled chickpeas handy in the fridge and toss a salad when in a hurry. 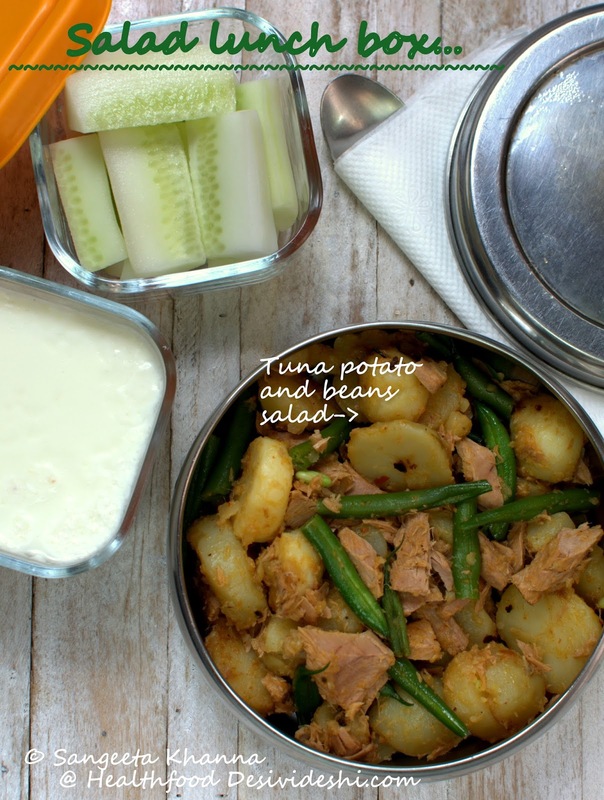 Stocking some paneer, some cooked beans of any type, some poached or grilled chicken, some tuna flakes etc saves a lot of effort from assembling salad meals or lunch boxes. Stocking some roasted seeds and nuts also saves time. Keep them refrigerated if making a bigger batch. Plan shopping of fresh produce like vegetables, fruits and leafy greens weekly so you have good options to prepare balanced meals always. Salads or otherwise. Some salad dressings can also be prepared and stocked in glass bottles. This sesame based dressing is my favourite to stock, others I just whisk last minute. If you have some dips in the fridge you can just cut wedges or batons of vegetables and fruits, rinse them with dilute vinegar and pack with any of the dips or even plain peanut or other nut butters in the lunch box. Be very careful with raw salads during summer months and rainy season I repeat. Use a vinegar based dressing or just go for stir fry or steamed salad options. Some pasta salads can be cooked the one pot way too. 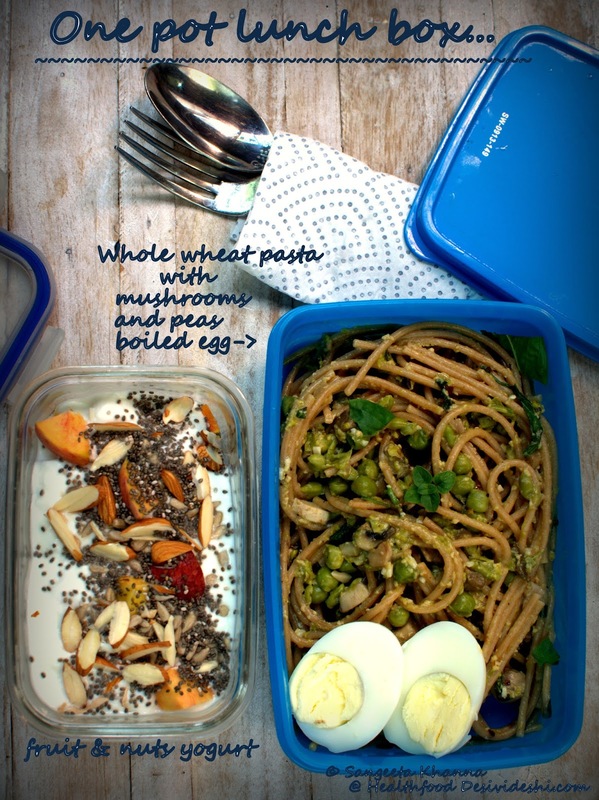 And now I am sharing 7 lunch boxes with salads and how I like to pack them..
1. 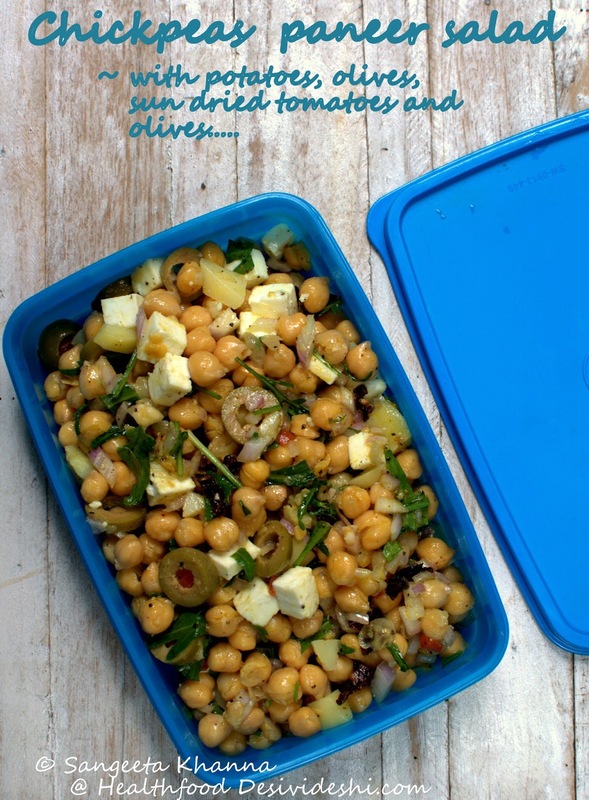 Chickpea, paneer and pumpkin stir fry salad.. 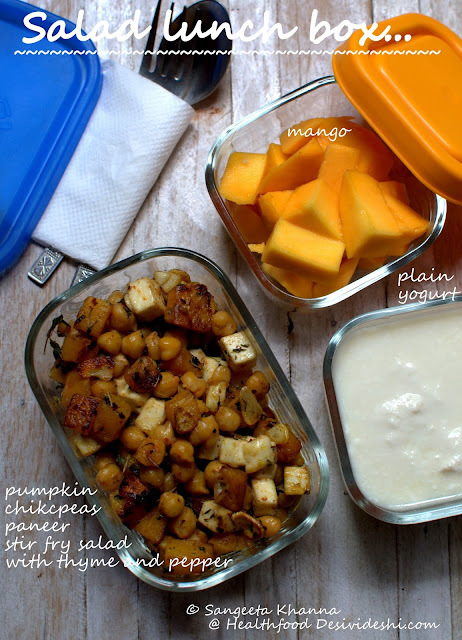 This one takes 15 minutes to make if you have pumpkin, boiled chickpeas and paneer in the fridge. Just pan grill thick pumpkin slices with salt, pepper, garlic slices, thyme and little butter about 5 minutes each side and then chop them in cubes. Now add cubed paneer, chickpeas and a bit of lime juice to the same pan and toss them all together lightly. Pack in a lunch box. Yogurt is good to pack with this. Mango was packed with it for a snack or dessert serving. It does make a lavish lunch box for sure. This chickpea salad takes just 10 minutes to assemble if you have a well stocked fridge. Boiled chickpeas, boiled cubed potatoes, cubed paneer, sliced olives, onions and rucola leaves make this salad quite flavourful. I added mustard vinaigrette and some sun dried tomatoes to make this salad texture rich. Just take care the chickpeas are boiled soft when you make such a salad. Hard boiled chickpeas make such salads feel too dry sometimes. Have bitten by hard chickpeas trust me. This one takes 20 minutes to cook. 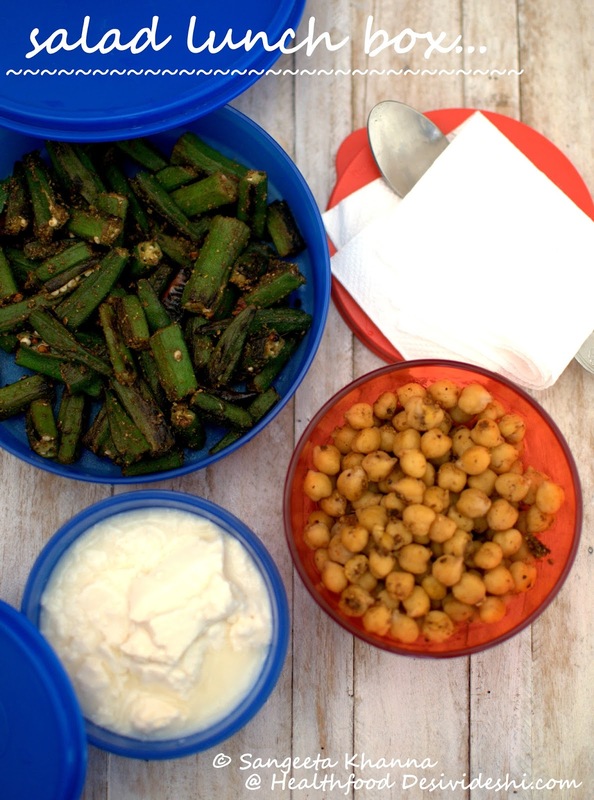 This is the kashmiri spiced okra, a much repeated recipe in my home and I do have it as a salad too. If you don't have okra as a salad you must try once and see how you get converted. So stir fry the okra, empty in a lunch box and then quick stir fry the boiled chicpeas too in the same pan with the residual spices clinging to it. Pack in the same box or keep it separate. Plain yogurt is what I prefer with it. Try this combination and tell me how it was. This one is a 5 minute job on the kitchen counter if you have some hung yogurt handy. Peel and chop cucumbers in bite sized pieces, season with whatever you like, I added flax seeds dry chutney powder, top with hung yogurt and then sprinkle some chopped roasted nuts or crushed roasted peanuts. I had packed some bread croutons with this salad in case I feel like having them, I did not need them with this yummy salad. One of my absolute summer favourite salad. Another 5 minute lunch box for you if you love salads or for those days when you need a lighter lunch box. This is a frequently repeated salad too, the recipe of pear rucola salad was shared earlier but I do keep changing it a bit every time I make it. Any nuts and seeds are suitable for this one. Not to forget yogurt with it of course. This one takes about 10 minutes to cook. This is a stir fry salad as I like the potatoes of this season to be a bit more flavorful. Winter potatoes will be used directly (boiled and halved or sliced) but I like sauteing them with mustard oil (or olive oil), some salt, pepper, garlic powder and chilli flakes for flavour. Added steamed beans (quick parboiled) and flaked tuna (from tin) and tossed well, the salad goes straight to lunch box. Some cucumber batons and yogurt with this is a better idea. I usually get some chicken legs, simmer them for about an hour on low flame along with some spring onion and bay leaf etc and make shredded chicken with it. Chicken breast can also be used but it gets dry very easily in a lunch box. The chicken meat is chopped into bite sized pieces, the bones are further simmered to make a rich stock for a curry or soup and everything is reserved separately, refrigerated for later use. This way the salad takes about 15 minutes. Saute some sliced onions and chopped beans to cook them lightly, retaining the textures. Add the mushrooms and saute some more, add cooked chicken and saute some more till flavours are absorbed. Pack. I used whole red chilies, Chinese five spice powder and garlic powder to make it flavourful but you can add just anything you like. I would like a few cucumber batons with this one too but this salad was made the day we had returned from travel so there was nothing fresh in the fridge. This chicken and purple cabbage salad can be a great lunch box salad too. During summers my meals revolve around freshly tossed salads and watery vegetable stews as my tolerance to heat is quite low. Adding loads of vegetables is my way to make meals hydrating. I love one pot meals too as my comfort food at home, a hot bowl of khichdi or a freshly tossed salad is my idea of a comfort meal. I can have my khichdi with just a drizzle of ghee and a glass of buttermilk on the side but somehow I find packed lunches need a bit more to it as the food changes a little after 3-4 hours while it stays packed. My one pot lunch boxes will be the ones that are hydrating type, do not feel dry to eat after 3-4 hours and have some textures in it. Soba noodles get cooked fairly quickly and cooked soba noodles refrigerate well too. Add some sauteed assorted vegetables with your favored seasoning and toss it with cooked soba noodles. Add some chopped boiled eggs on the side and make a balanced filling meal. My ratio for this soba noodle salad is 40 gm raw soba noodle per serving and 200 gm assorted vegetables. I added loads of garlic and salt and pepper only to this cold salad and it was an absolutely delicious meal. 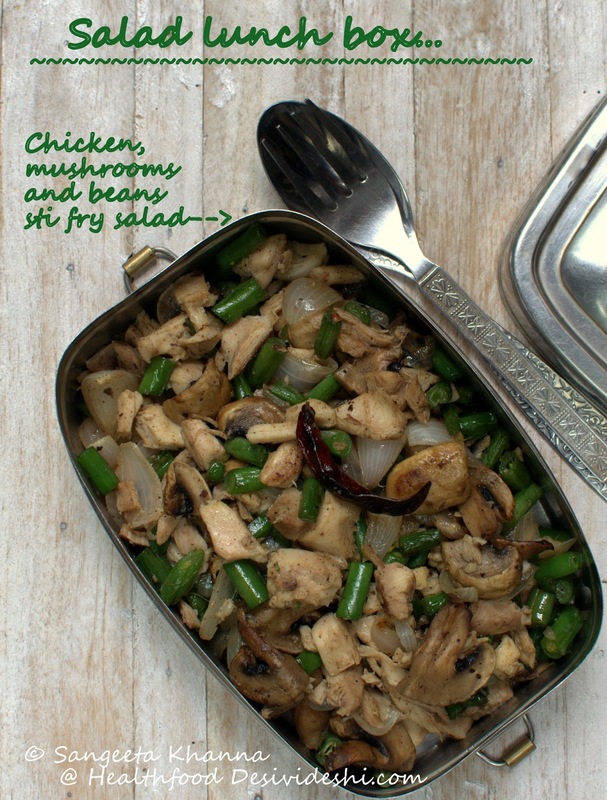 This one a strictly one pot meal, cooked in pressure cooker and packed directly into the lunch box. Chopped cluster beans (guwar) and cubed pumpkin is pressure cooked along with a tempering of chopped chillies, ginger and garlic, boiled chickpeas are added once the vegetables cook, some amchoor powder is added too and a delicious meal is ready to be packed. You might like to add tomatoes to this one, I like amchoor a lot with chickpeas and pumpkin but lime juice could also be a good choice. 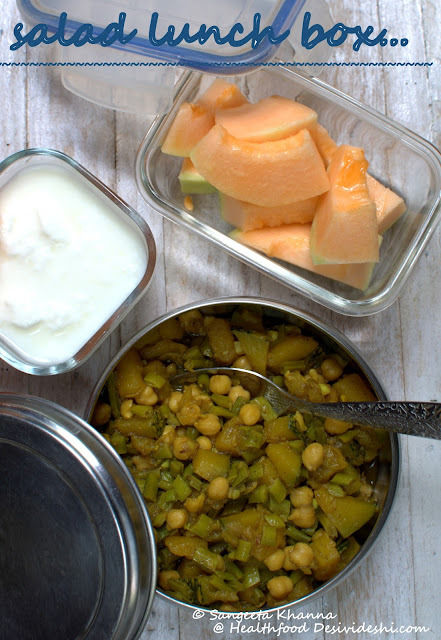 Musk melon and yogurt was packed with this meal to break the monotony. I know the stew looks drab but I love this kind of meals. Whole wheat pasta takes long time to cook so I have devised a way to make it quick in the mornings. Pressure cook 40-50 gm pasta per serving with about 200 gm water and salt (one whistle and 5 more minutes if cooking 2 servings). Add 1 tbsp butter, minced garlic, frozen peas and chopped mushrooms once you open the pressure cooker and toss and cook till the peas get soft, takes about 3-4 minutes. Add herbs of choice and pack with boiled eggs or shredded chicken. I had packed mango yogurt with almonds and chia seeds but it was not eaten, the whole wheat noodles are quite filling. Yes it makes a nice one pot meal too. Just pressure cook chana daal with loads of spinach in pressure cooker, add tempering of your choice and small cubes of paneer, simmer for a couple of minutes and it is ready. Check out chane ki daal paneer wali to find a detailed recipe. Chane ki daal bathue wali is also a base recipe for this one. 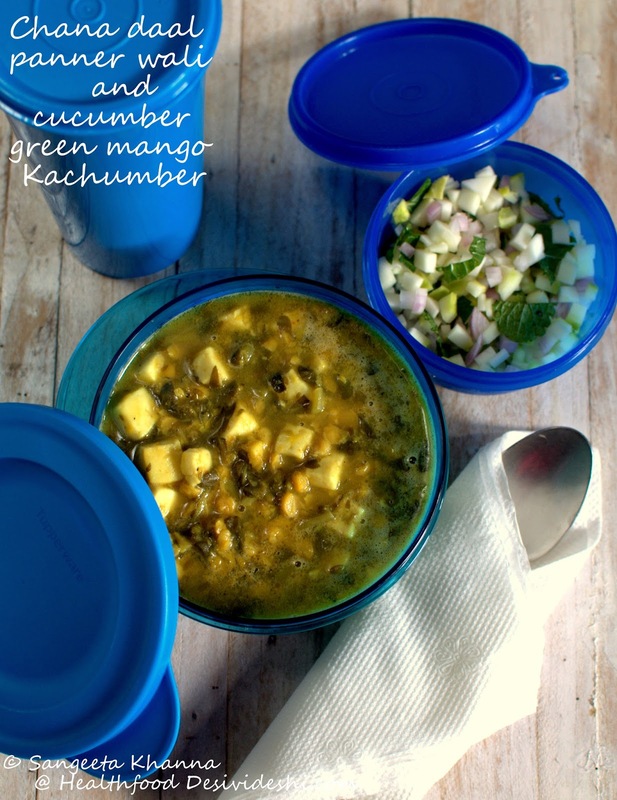 Some kachumber salad and buttermilk will be good with this, or just make a raita. 5. Millet risotto for lunch box.. I cook with millets a lot but for lunch boxes they get used only when I make dosa or idli or for multigrain rotis and breads. 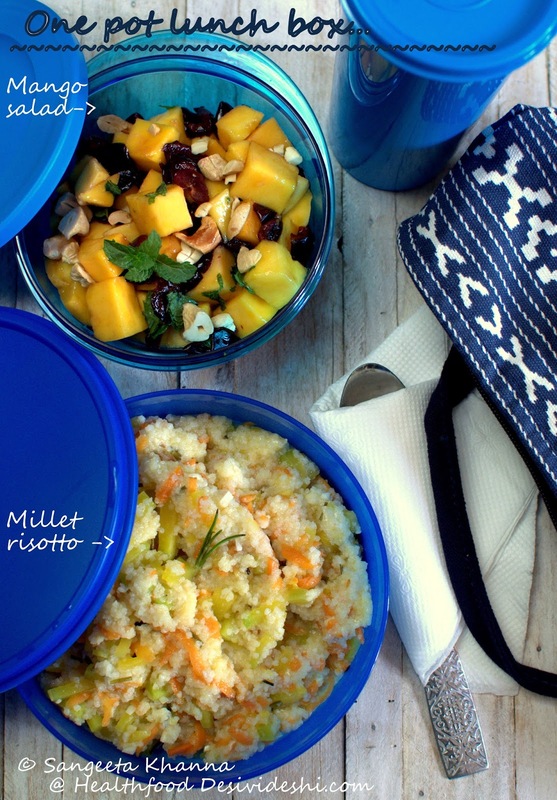 Direct cooking with millets is more for hot meals but a risotto works fine for lunch boxes too. This one is a barnyard millet and carrot-pumpkin risoto with rosemary garlic. This risotto is cooked in one step, no addition of stock or wine but the flavours of rosemary and garlic make this nice. For 2 servings cook 100 gm barnyard millet with double the amount of water, add a cup of finely chopped pumpkin, 1/2 cup grated carrots and 1/4 cup grated potato to the simmering risotto along with salt and pepper. Add chopped rosemary, garlic and 1 tbsp butter and cook till millet grains get soft and it reaches risotto consistency, adding water if required. Add grated Parmesan, mix well and pack. I packed a mango, balsamic preserved cherries and cashew nut salad with it fearing the husband might not like it but he loved it. 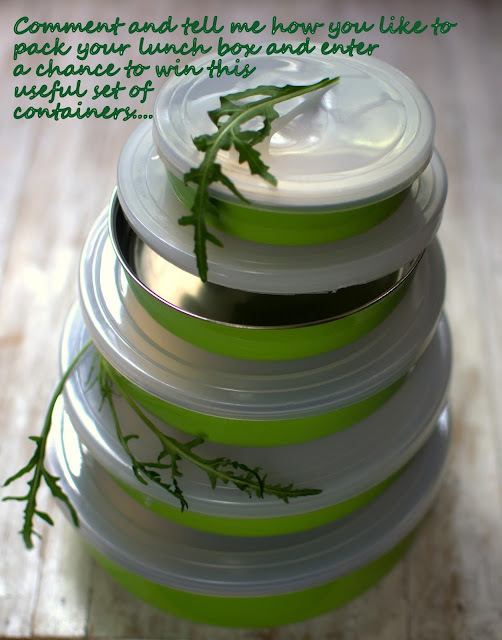 Tupperware lunch boxes are quite convenient for this kind of meals as they are completely leak proof. But use them only when the meals do not need reheating. I find this set of lunch boxes useful for my requirements. And here is another giveaway for you all along with a few more that I announced for the lunch box series. 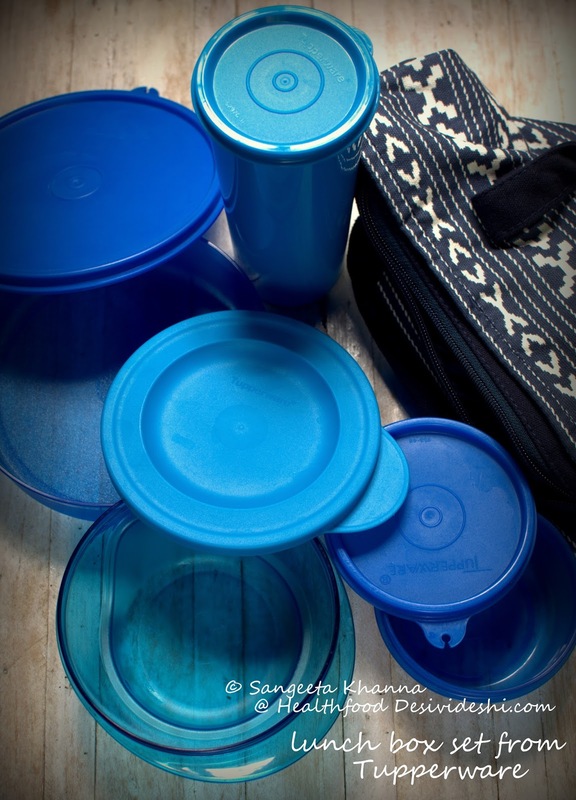 A set of brightly coloured steel lunch boxes or multipurpose containers with plastic fitting lids (hopefully great leak-proof too), is up for another giveaway. Just write about your lunch box, how you like them and how you are finding this series too. There is a nice Tupperware steamer, a hand painted steel lunch box, a couple of glass bottles up for giveaways too in this series so please comment here and enter a chance to win one of these. Please write your mail id too, I will be shipping these beauties to any Indian address. I really like your lunch boxes..light n healthy. Infact generally at my place it is roti..sabzi..salad n curd..which is a must in every meal. But I love ur lunch boxes..infact planing to start sumthing like this for my huband too..
My email id is " mail.shivanijain@gmail.com"